After four days of 31 Rohingyas stranded at zero point in between the India border fencing and border pillars demarcating India and Bangladesh at Rayermura area in Sepahijal district in Tripura they were arrested by BSF on Tuesday and handed over to the police. This is the second incident of arrest of Rohingyas in the region in less than 24 hours. On Monday evening 30 Guwahati-bound Rohingyas were arrested by the Assam police from a bus at Churaibari in Tripura-Assam border. The arrested includes 16 children and nine female and since Friday they were in uncertainty and spending day and nights under open sky as border guards of both the nations were alleging each other for pushing them to the other’s nation. However, on humanitarian grounds BSF later provided the stranded Rohingyas with food, water, medical checkups and tents. Today BSF ultimately arrested them and handed over to the state police at Amtali police station. SDPO Amtali Ajay Das said that the suspected Rohingyas were detained by BSF and handed over to Amtali police which has registered a specific case under India Passport Act and forwarded them to the court after health check-up. 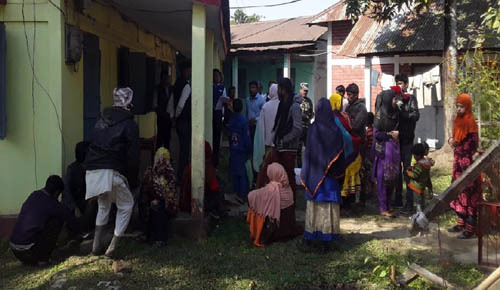 However, Abdual Sukur one of the arrested persons said that they had come here from their Jammu refugee camp and were trying to sneak inside Bangladesh but were apprehended by BSF and alleged the India border guards of snatching their UN refugee cards. Meantime, the other 30 Rohingyas who were arrested at Churaiburi were sent to Karimganj court said Soumitra Bhattacharya, officer in charge of Churaibari watch post of Assam Police. He informed that during regular check-up of passenger bus entering from Tripura to Assam on Monday evening at around 6.30 PM police suspected a few passengers travelling in a night super of Network Travels bearing registration AS25CC8685, which was coming from Agartala. Initially police thought them to be Bangladeshis but during interrogation they identified themselves as Rohingyas. They also found a valid UNESCO card with the Rohingyas.